I know I've done a lot of waffling on this blog recently, but work on the old girl has been plodding on. 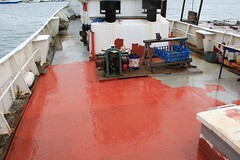 Here you see the recently completed rust busting on the last bit of deck left exposed after the wood had been hacked off last year. Just as the painting was finished, it started to rain. Good timing! I've more paint on order, so can finish off this section properly sometime soon. I'm thinking next I may break out the concrete on the edges by the scuppers, and then cut a notch lower in the scuppers, so I don't get those annoying puddles you see there. 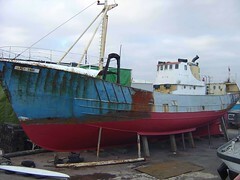 I'm starting work on the 'fishing Lady Jane out of the water' project. This is her last time she was properly taken out, by her previous owners. First things first, I need to get my hands on some docking plans, as the yard need that for a safe haul out. Any help I can get with this will be gratefully appreciated. So here is the crane that had been loaded onto that truck a few hours previously. They had made it round a left hand bend then a right hander at the lights, where it fell off. Right by the bus stop and not far from where it had previously been moored all those years..
Oddly enough I had mentioned to a bystander earlier that they would have to be careful going round corners with that load on. It turns out it was the guy who had just sold the crane. He said it would be fine - Ha. By the time I got there to take a picture, no less than three large lifting trucks, like you can see in the picture had descended on the scene, along with the police and a few council workers to assist. I'm guessing that once all the bills from that lot are paid, what was a tidy earner for someone turned into an expensive nightmare. As you can imagine, traffic in Southampton over the Northam bridge was a nightmare while they got the crane back on the bed of the truck again. The other weekend, on the Friday, I watched this crane being removed from it's barge. It had been moored upriver from the Northam bridge for quite some time. The crane, asides for it's tracks, is remarkably similar to the crane on the barge next to me. The barge by me is much smaller though. It all looked like some operation, with the bulk of the work being performed with oxy-acetylene cutters and that big digger you see there. 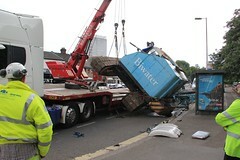 The next morning, I watched it being loaded onto a big truck - using the big digger to nudge it up the ramp. Apparently the crane is sold to someone in India, who will refurbish it and presumably use for the next fifty or so years. 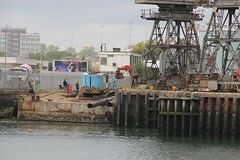 The barge is destined for London, presumably pressed into service for some scheme relating to the Olympics there. This weekend marks the seventh year I've now had Lady Jane. Obviously there have trials and tribulations along the way. Overall though, it's been a lot of learning and a lot of fun. I've been away travelling again.